Parlay at Joy District just launched their Sunday brunch from 11am to 4pm, perfect for nursing your hangover and/or catching the noon Bears game on one of their nineteen big screen televisions. The brunch is an all-you-can-eat buffet served in Joy District’s upstairs balcony area with long tables filled with anything anyone could ever need for breakfast. At a reasonable price of $30 per person, guests can stock up on warm eggs, potatoes, bacon and sausages at the first stop along the buffet journey. Making your way down the line, guests will see more rotating savory options like salmon, ham, charcuterie and cheeses. 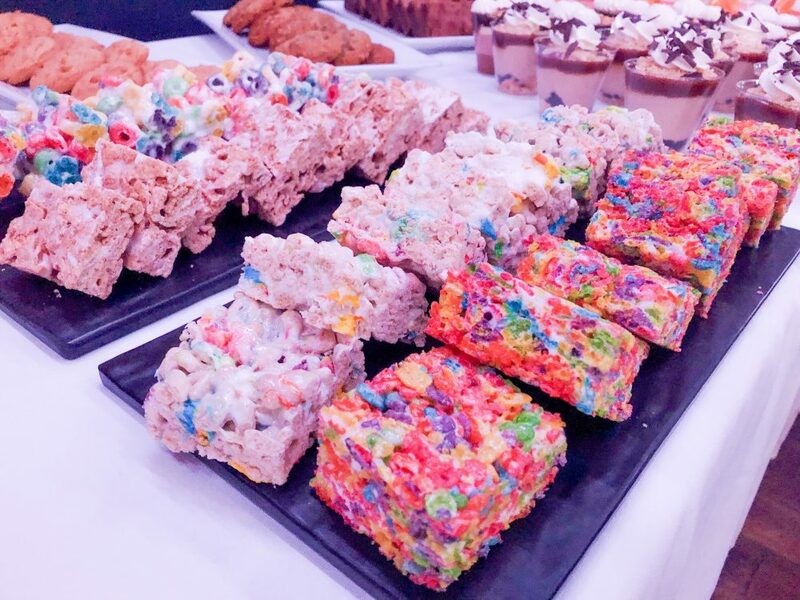 There is a table for the cereal bar but we encourage you to skip that and head straight to the dessert table where rows and rows of cereal BARS are waiting. The Lucky Charms and Cinnamon Toast Crunch cereal bars were our favorite, held together with marshmallow fluff not unlike a Rice Krispie Treat. You can get your cereal fix in a much sweeter and satisfying way! 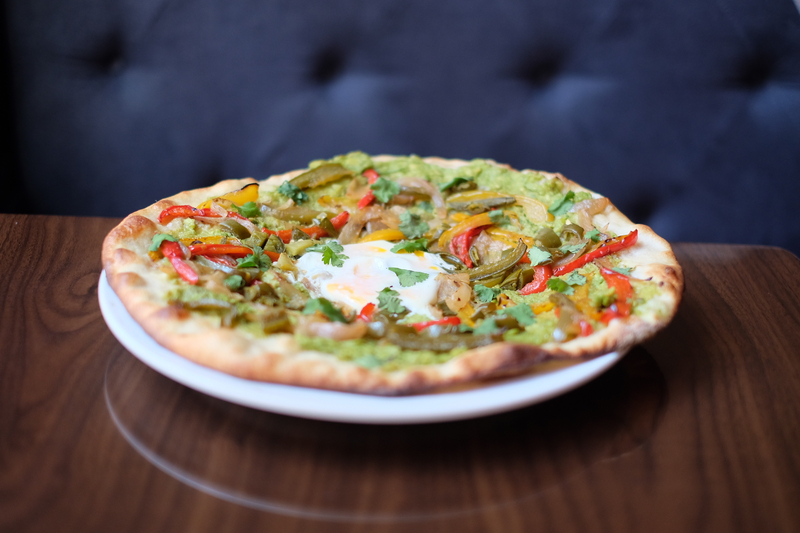 If you are feeling pizza for brunch, Parlay has your back…and your stomach. Your choice of pepperoni, cheese, sausage or specialty pie on a thin crust is cut into small squares so it’s easy to grab a few too many slices. However, we urge you to save room for the best two tables at Parlay: the waffle and omelet stations! Create your own at each station with tons of toppings or add-ons to choose from. 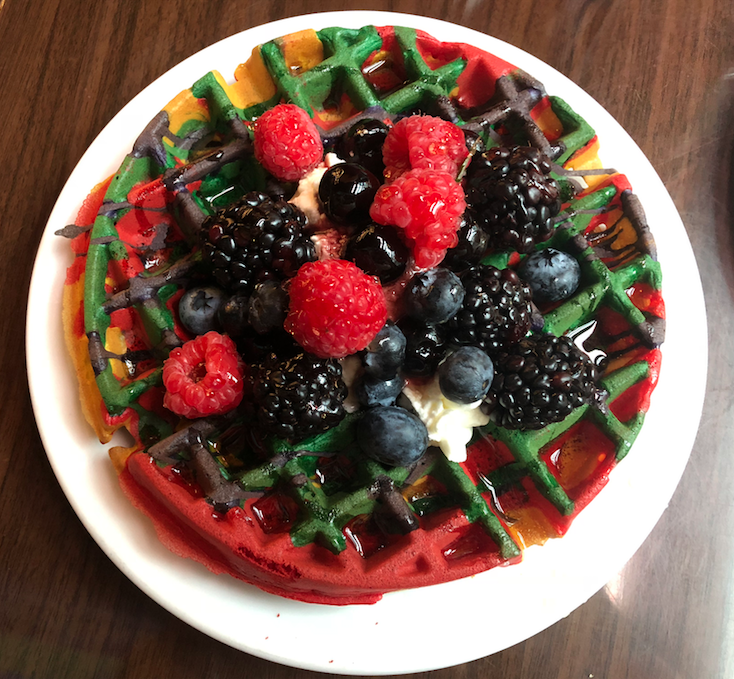 The waffles are crafted with four different colors for a special tie-dye look after it’s finished cooking in the waffle maker. Choose from fresh fruit, sprinkles or whipped cream and of course, the obligatory syrup for your toppings. This is definitely one of the best options at the buffet! Omelets are done with whole eggs or egg whites depending on your preference with about a dozen options of veggies and cheese to add into the pan with it. The station is probably the healthiest route upstairs and is strategically positioned next to that dessert table mentioned above. 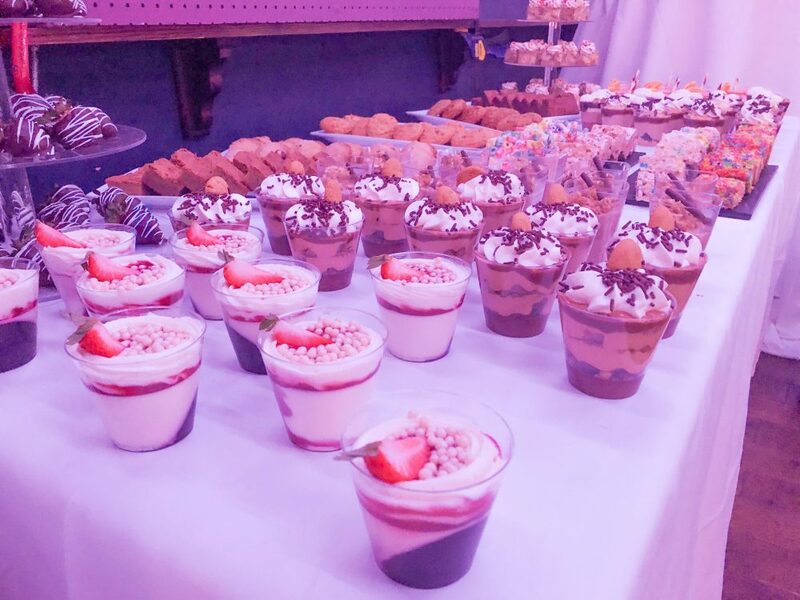 In addition to the nostalgic cereal bars, the dessert table features several sweets including puddings, Jell-os, seasonal donuts and parfaits. Chocolate-covered strawberries are a no-brainer and there are plenty of shortbread cookies as well. Parlay's Dessert Table is loaded with sweets! You should come hungry and ready to drink as well! The regular Joy District cocktail menu is available however for $50, guests can enjoy the buffet AND a mimosa bar. Get more booze for your buck as regular cocktails typically run in the $14 range. Alternatively, go big or go home and opt for the $100 Mega Mimosa loaded with two bottles of prosecco and orange juice. 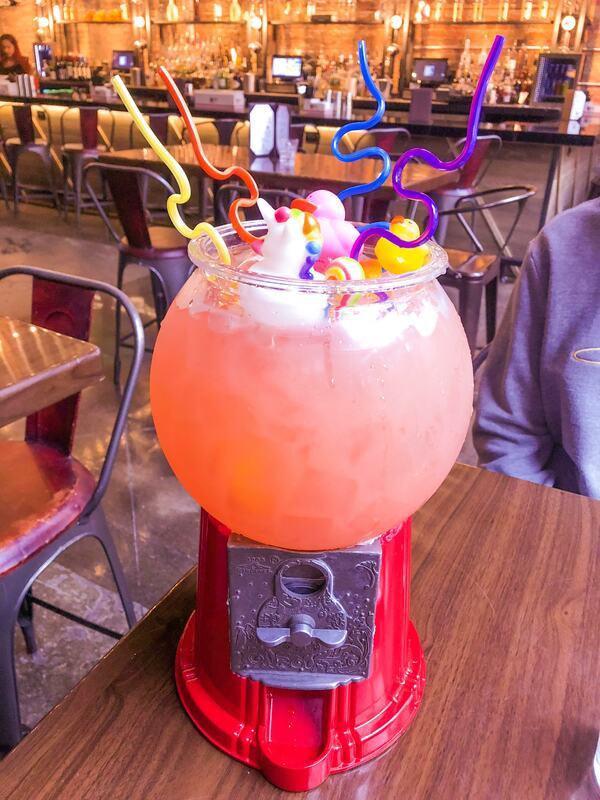 If your crew isn’t into mimosas, we recommend sharing the Scrumdidiliumptious ($24) with Cruzan Strawberry, Pineapple, and Orange, simple syrup, lemon and cranberry juice, topped with Chandon Sparkling and served in a Gumball Machine. The menu says it is for 1-2 people to share but strength is in numbers so bring a few more friends for this one. Or make new friends to share this delicious concoction. Stay for the game or stay for the booze at Parlay’s new Sunday brunch! Bring your friends to accept the Scrumdidiliumptious challenge!